Top 10 Technology Tasks to Outsource. Selling offshore concept to your organization. Offshore Risks: Team and Personal Impacts. Outsourcing Impact on Technology Choice. Pros and Cons of Outsourcing QA. Top 10 Reasons NOT to Outsource. The Darkest Side of Outsourcing. 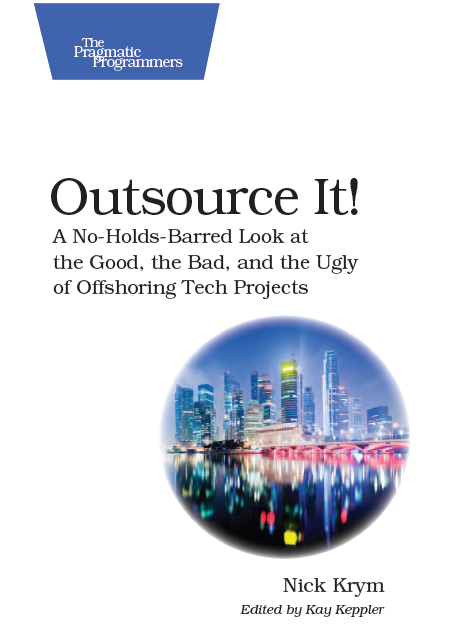 10 Myths of Offshore IT Outsourcing Revised. Offshore, Nearshore, Right Shore, Best Shore… oh My. Offshore Vendor Selection: Choosing the Destination. Pros & Cons of Outsourcing to India. Pros and Cons of doing business in China. Not Yet Ready for China. S/W Development Outsourcing: China vs. India. Pros & Cons of Outsourcing to Latin America. Pros & Cons of Outsourcing to Canada. Pros and Cons of Outsourcing to Brazil. Top 5 Rules of Vendor Selection. Generating a List of Prospect Vendors. Offshore Vendor Selection: Site Visits. Top Emerging Companies in India IT-BPO. Offshore Model Selection: T&M vs. Fixed Bid. Using Contracts to Mitigate Offshore Risks. Offshore Negotiations and Rules of Haggling. Offshore Negotiations: a Macro View. Protecting Data and IP when Outsourcing Offshore. The Myth of the Onsite Coordinator. Downfall Impact: Do you keep your current provider? Perpetual Search vs. Status Quo. Outsourcing L10N, G11N and i18n. Using Freelancers: Pros and Cons. Notes from a Data Entry Gig. Data Entry Gig: Execution Control. Five Steps to Keeping your Business. Twitter – a New Tool in my Offshoring Toolbox. 10 Annoying Things Freelancers Do to Destroy their Business. Path toward Disposable Outsourcing: S/W Development. Path toward Disposable Outsourcing: QA. Satyam Chairman Admits Huge Fraud. Outsourcing in the Light of Bribe Payers Index. ‘08 – the Year of Predictions. Still looking for ‘09 Predictions? 1 out 4 IT jobs moving offshore. CIO.com Perspective on Offshore Risk Management. IT Budgets Will Go Up Or Stay Flat For ‘09. 25 Random Things that Can Hurt You. Japanese Car Invasion vs. Offshore Outsourcing. Slowing Down, no Intentions to Stop. Don’t Fall Asleep Behind the Wheel. “Yes” to death Can’t teach an old dog new tricks.